Welcome to the Typosphere: Hammacher Schlemmer Flimflam? Yeah, 200 bucks for this is 200 bucks down the drain. However, it seems to indicate that manual portables are still being made in China, which is kinda nice to know. Sheesh! My 1930s Corona cost less than that. Lauren, I'm sure that Corona is a lot better-looking, too. And has another few decades in it. and here is a blatant falsehood: "The 44 keys make 88 symbols in 10-characters-per-inch Pica 87 font." the period, at least, would mae the same character. 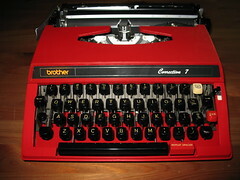 I have one of those, given to me as a gift and actually my first typewriter. It is highly disappointing, and not a Royal at all. I know it's not a Royal because I saw an indentical "Olivetti" somewhere.